In order to make child learners efficient thinkers by appreciating them to arrange and rearrange as well as easy to connect segments in the endless combinations, Code-a-pillar has been developed. This learning toy is encouraging the experimentation at the time of developing essential skills such as problem solving, planning and sequencing as well as critical thinking. The kids can make a numerous combinations by mixing up the segments and putting them back together in order to send Code-a-pillar in the different direction every time. Code-a-pillar takes a different path every time when kids change and rearrange his segments. It includes one sound segment, three straights, two right turns as well as two left turns in order to send the learning fun in many directions. This gives the opportunity to kids in order to configure the segments so that Code-a-pillar can reach the targets which they have set up throughout the room. 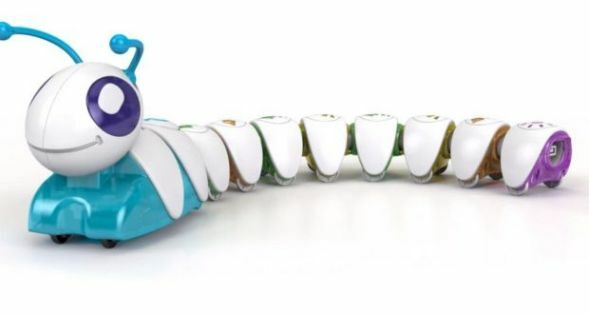 Code-a-pillar has been considered is one of the new Think & Learns toys from Fisher Price which can go beyond the ABCs as well as 123s in order to help children in learning how to think independently. Each of the toys fosters present century skills such as curiosity, experimentation as well as problem solving in such a ways that kids have not seen before.